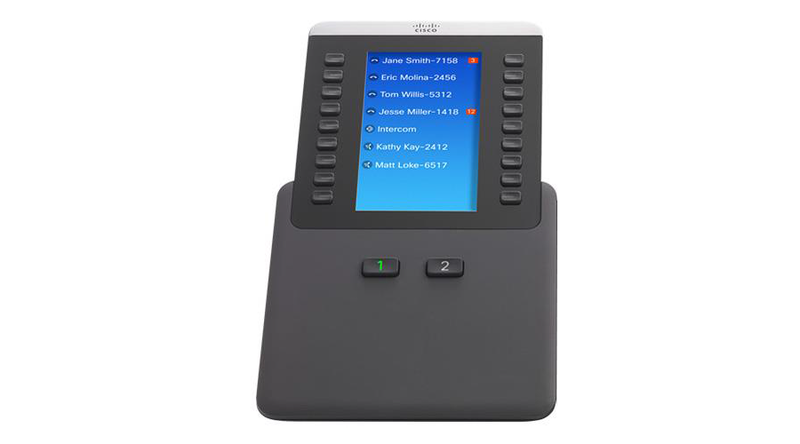 You can articulate the display to match the same angle as the Cisco IP Phone 8851, 8861, and 8865 that it is connected to. The module has 18 physical buttons (36 using page keys). Use the two page buttons to access each page of 18 buttons and provide phone status. When Cisco IP Phone 8851, 8861, and 8865 models are in power-saving sleep or inactivity mode, the Cisco IP Phone 8800 KEM is also in sleep or inactivity mode. Pressing any button on the key expansion module causes the display to awaken. The system administrator configures the inactivity period.